The name “Victor Espinoza” has most of the racing community thinking of a certain Triple Crown-winning jockey. To anyone familiar with Brookdale Farm in Versailles, Ky., however, the name brings to mind a different individual. 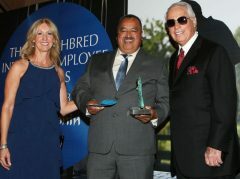 Brookdale's Victor Espinoza epitomizes the spirit of Godolphin's newest initiative, the Thoroughbred Industry Employee Awards. Intended to “to identify and acknowledge, to celebrate and reward the true heroes and backbone of our industry,” in the words of Godolphin America president Jimmy Bell, the TIEA awards bring a new level of recognition to racing's behind-the-scenes employees. Though Godolphin has similar programs in England, Ireland, Australia and France, Espinoza admits he hadn't heard of the U.S.-geared TIEA awards until he was informed of his 2016 nomination. It may have been the first time the awards were offered in the U.S., but the effort put forth for last year's inaugural edition by Godolphin and the National HBPA, Thoroughbred Owners and Breeders Association (TOBA) and The Jockey Club has drawn a new level of attention to what often can be very thankless jobs. The top prize for each of six categories includes not only a commemorative trophy, but also $10,000. Characteristically, Espinoza sent most of his prize money back to his family in Mexico, saving the rest for his retirement. To him, the award wasn't about money. For a kid from a small town in Mexico, the TIEA award could be seen as the culmination to his lifelong dream. Espinoza grew up with the knowledge that he was destined to be a factory worker, along the lines of his union-leading father. He adds that he could have gone to college, but all the corruption in Mexico would have meant buying his way into most any job after graduation. On Sundays, he attended match racing out in the “bushes,” and only fell more in love with the horses. While traveling to the United States to pursue his passion occasionally crossed Espinoza's mind, he usually dismissed the idea as an impossibility. In Mexico, making it to the United States was an all-too-common dream for most, chasing the jobs and opportunities offered on the northern side of the Rio Grande. The problem was a financial one – making it across the border required cash, and plenty of it. One fateful afternoon, a friend told Espinoza about a crew heading up north. Somehow, the 19-year-old scraped together just enough money to make it to the border. He would eventually secure a Green Card establishing his legal status. Espinoza's willingness to work and basic knowledge of horses found him easy employment at racetracks across the southwestern United States. For nearly three years he traipsed across the country, working at different tracks and learning everything he could about the Thoroughbred. The travel got to be overwhelming, so Espinoza took a job at a Saddlebred farm in Lexington, Ky. Shortly thereafter, he met his future wife. Near the end of the summer in 1985, Espinoza finally gave in to a friend who'd been trying to get him to apply for a job at Brookdale Farm, which had been established two years earlier by Fred Seitz. Hired after just one conversation, Espinoza's first position was as a groom in the yearling barn, preparing young Thoroughbreds for the sales ring. “It was slightly different, but it was a pretty easy transition,” he said. “But when you start a new job, you just don't know how long you're going to stay. You know, I was a young guy, so I didn't take anything too seriously. I worked hard, though, and I didn't mind staying late or working the extra short shift. The job he'd assumed would last approximately a month quickly turned into several, and it wasn't long before Espinoza transferred over to the stallion barn. In those days, Brookdale was home to several top sires, including Deputy Minister. Deputy Minister was the horse who would literally leave his mark on Espinoza. In the young groom's first week in the stallion barn, Deputy Minister bit him, grabbing him by the chest. Several more years passed, and Espinoza was promoted to stallion manager. 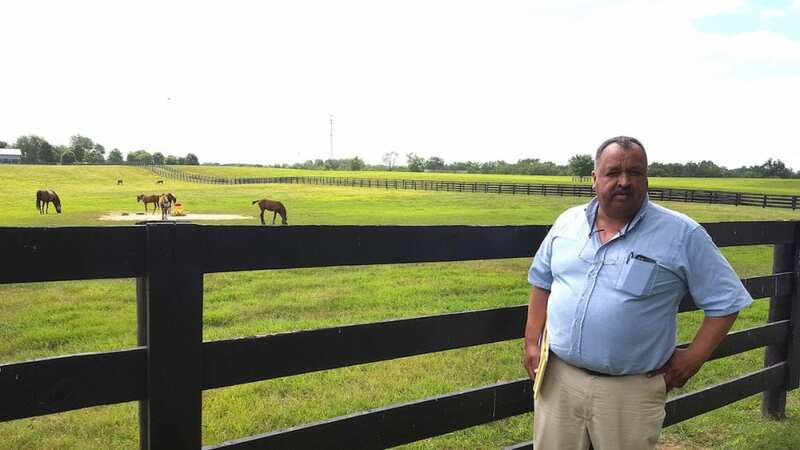 Espinoza's attitude remained the same when he was chosen to be Brookdale's farm manager. After all, not much had changed, as he'd always played an active role in all the farm's activities. While Espinoza's personal story and his diligent work habits are certainly admirable, what really sets him apart is the atmosphere at Brookdale. Espinoza insists that the Seitz family's generosity is a major factor, explaining that there is a staff luncheon the last Friday of every month. Dr. Jeffrey Berk, however, insists Espinoza's leadership plays a defining factor. Though age has begun to creep into the lines on his face, Espinoza and his infectious smile aren't looking to retire just yet. He hopes to be around to watch future TIEA winners take their turn in the spotlight, and perhaps even to have helped one of them on their journey. This entry was posted in Connections, NL Article, People and tagged Breeders' Cup presents Connections, Brookdale Farm, Chelsea Hackbarth, Connections, Dr. Jeff Berk, fred seitz, Godolphin, godolphin thoroughbred industry employee awards, Horse Racing, jimmy bell, national hbpa, The Jockey Club, Thoroughbred Owners and Breeders Association, TIEA by Chelsea Hackbarth. Bookmark the permalink.